Spring is the season for entertaining, so why not create this Mexican rice salad for your friends and family this weekend? If you’re not a fan of the heat, this particular dish contains an even balance of spice and flavour, and also incorporates some lush, fresh ingredients including pineapple, capsicum and cherry tomatoes. Preheat a grill pan over a high heat and rub a little olive oil over the corn cobs. Place the cobs onto the grill pan and cook each side for around 5 minutes until the corn is charred and slightly blackened in places. Remove from the pan to cool. Cut the kernels off the cooled cob of corn by placing the corn cob on an angle and carefully cutting from the top. Add the corn kernels to a large salad bowl. Into the same salad bowl add the basmati rice, pineapple, cherry tomatoes, capsicums, red onion, celery and chopped coriander. Toss all of the ingredients together to combine. In a small jar place the Cholula Original Hot Sauce, lime juice, castor sugar, olive oil, salt and pepper and place the lid on. Gently shake the dressing ingredients together to combine and dissolve the sugar. Drizzle the dressing over the rice salad and gently toss to coat all of the ingredients in the dressing. Garnish with a sprig of coriander. 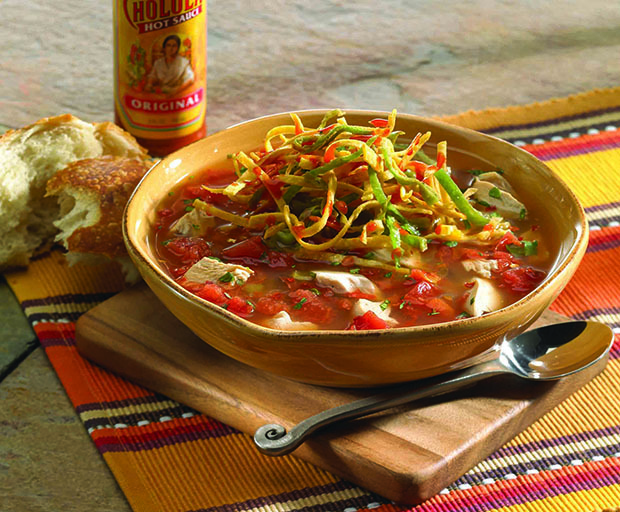 Spice up your life with this chipotle chicken tortilla soup recipe! 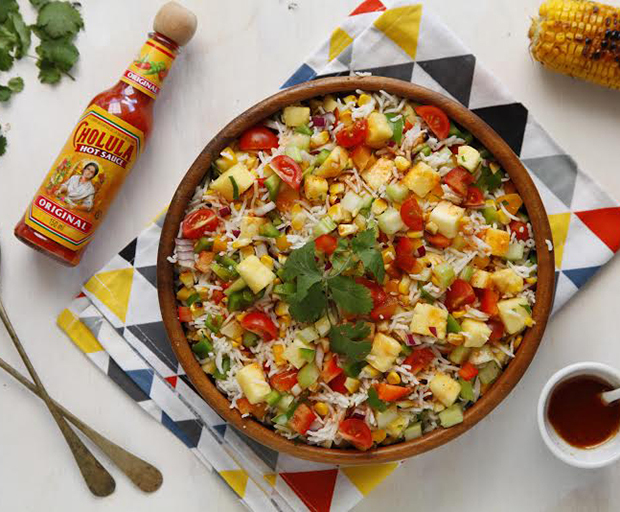 A delightful balance between heat and flavour thanks to the Cholula Hot Sauce, this dish will please even the fussiest of taste buds. Serve with extra sauce for an added kick! Ex-Olympic swimmer and mother-of-two, Susie O’Neill shares her favourite summer recipes as part of the Together Counts initiative, an online resource encouraging Australian families to lead healthier, active lifestyles. These prawn tacos are light and fresh and perfect for a warm day, plus they’re ready in under 30 minutes, making them one of the best after-work quick dinner ideas. 1. Toss prawns in spice mix to coat. Heat oil in a frying pan and cook prawns for 2 minutes or until pink. Combine cabbage, radishes, coriander to create a salad. Mash avocado with juice of half a lime. 2. Warm soft tacos according to pack directions. 3. 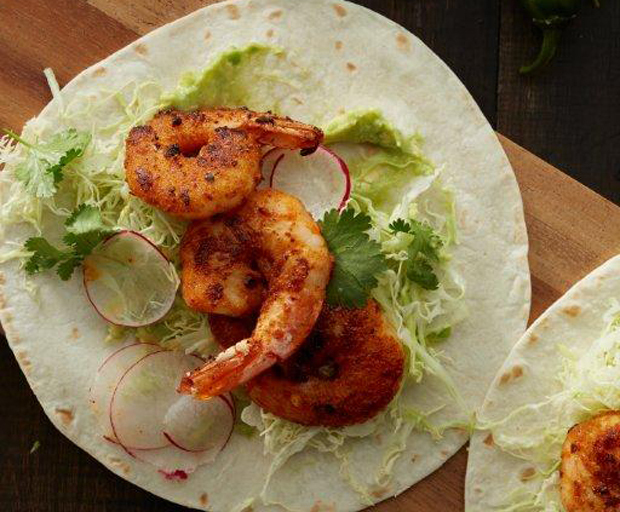 Build your own soft tacos, spread with avocado, top with cabbage salad and spicy prawns, and enjoy with a squeeze of lime. What are your favourite quick summer recipes? 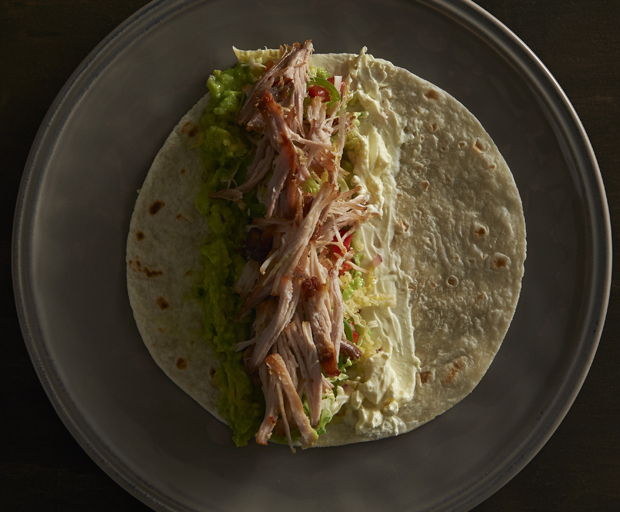 Once you slow-roast the pork, celebrity chef Neil Perry’s soft tacos couldn’t be easier to make, and are one of our family’s favourite quick dinner ideas. 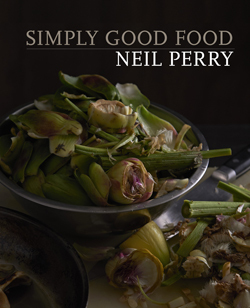 Recipe and image from Simply Good Food by Neil Perry, Published by Murdoch Books, RRP: $49.99. Too easy – this sauce is great with any fresh tacos. You can also just fry the tomatoes and when they start to melt, add a spoonful of chipotle chilli powder, cook for a minute longer, remove from the heat and squeeze in fresh lime. Cabbage salad, guacamole, sour cream, tortillas and a margarita…heaven. 1. Place the pork in a medium saucepan with the garlic and onion. Add a good pinch of salt, cover with water and bring to a simmer. Cook, covered, for about 2 hours on medium–low heat or until the pork is tender. Allow to cool before shredding the meat with your hands. 2. Preheat the oven grill. For the roasted tomato chipotle sauce, heat a heavy-based saucepan over high heat and add the unpeeled garlic. Roast for 15 minutes, turning halfway through, until the outsides are blackened. Remove from the heat, squeeze the garlic flesh out of the skins and roughly chop. 3. Place the whole tomatoes under the grill and cook until the skins are dark and blistered on all sides. Remove from the grill and allow to cool slightly before peeling. 4. Place the tomatoes and garlic in a food processor and blend. Add the chillies one at a time and process to combine. Taste the sauce as you go and, depending on the heat level you prefer, add more. 5. Heat the oil in a non-stick saucepan and cook the sauce over medium heat, stirring frequently, until the sauce has slightly thickened. Season to taste. 6. Heat 2 tablespoons of olive oil in a heavy-based saucepan, add the shredded pork and cook until it is crispy and golden. Add the raisins and roasted tomato chipotle sauce and cook for 5–6 minutes or until the mixture has thickened. 7. To serve, microwave the tortillas for 10–20 seconds, or according to the packet instructions, to soften and warm through. Place a large spoonful of the pork in each tortilla and top with the salsa, guacamole and a generous dollop of sour cream. Note: Marinate and grill fish or chicken to add more elements to your feast. The tortillas can also be steamed or warmed in a frying pan. What are your favourite midweek recipes? Meatballs are one of our go-to beef mince recipes, but pick up some minced pork and a jar of chipotle chillies in adobo sauce and you’ll have classic meatballs with a Mexican twist thanks to celebrity chef Neil Perry. A delicious spin on your everyday spaghetti and meatballs. Love these, look Italian, could only be Mexican when you taste them. The chipotle in adobo sauce is awesome to have around the kitchen. Add to any sauce for a fantastic smoky lift and I love them chopped through a vinaigrette for a salad. Serve these with tortillas for a fresh taco or serve them with rice or potatoes for a hearty tasty meal. If you really want to have a fab lunch, make a sandwich out of them. So damn good! 1. For the chipotle sauce, place the tomatoes, chillies and their sauce, garlic, cumin, oregano and salt in a blender. Add the stock and process until quite smooth. 2. For the meatballs, place the beef, pork, cumin, garlic, 1 teaspoon salt and a grind of pepper in a bowl. Mix well, then stir in the breadcrumbs, eggs and milk. To check the seasoning, cook a small amount of mixture and taste it. Form the mince mixture into small walnut-sized balls. 3. Heat a large frying pan with a splash of olive oil over medium heat. Add the meatballs and brown gently for 2 minutes. Add the sauce and cook gently for 6 minutes, stirring occasionally, or until the sauce starts to thicken. Reduce the heat to medium–low and cook, uncovered, until the sauce reduces to about half its original volume and coats the meatballs. 4. 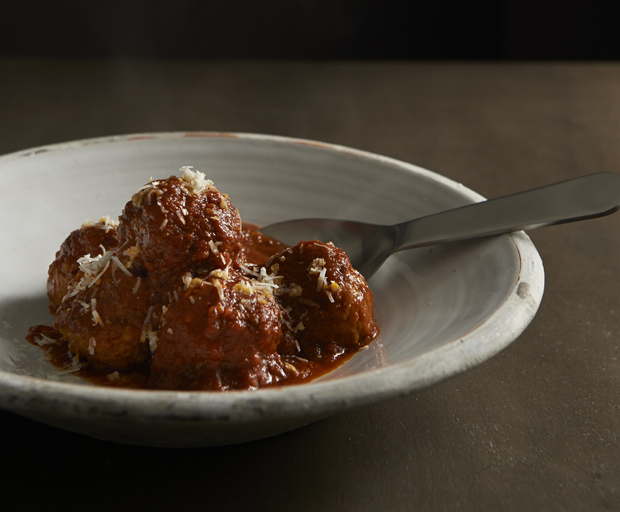 To serve, spoon the meatballs onto a serving plate and grate a little Manchego or pecorino over the top. NOTE: Chipotle chillies are red jalapeños that have been smoked and dried. Adobo sauce is typically flavoured with spices such as paprika, bay leaves and oregano. The two are available together in tins at selected delis and Mexican food suppliers. What makes your meatballs the best? Share in the comments! Imagine your favourite tomato soup recipe with the exotic Mexican flavours of cumin, corn and crunchy tortilla cheese chips. 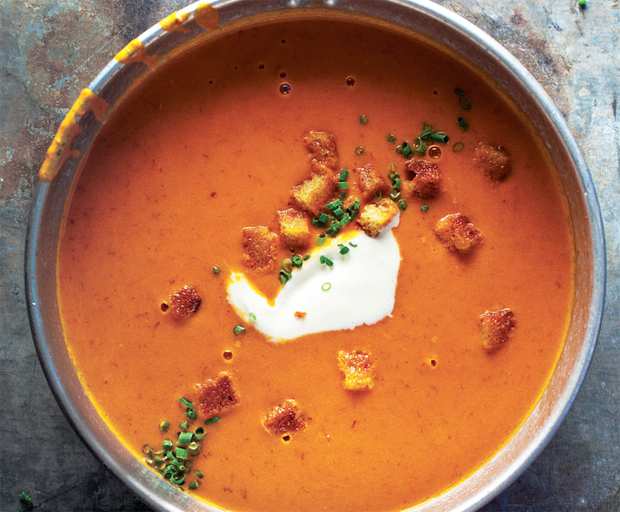 Make a big batch of this easy soup and freeze for lazy nights. For a heartier meal, add some cooked risoni or leftover rice to the soup during the last 5 minutes of cooking. Plus it’s easy to make this a vegetarian soup: just use vegetable stock and leave out the bacon. 1. Cut tortillas into triangles and place on a baking paper lined oven tray. 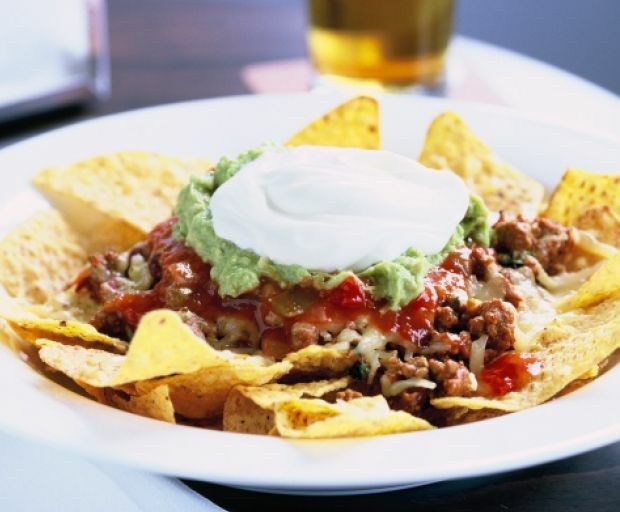 Sprinkle with cheese and paprika and bake at 180°C for 10 minutes or until cheese is melted and tortillas are crisp. 2. Blend half the corn kernels in a food processor until smooth and set aside. 3. Melt butter in a saucepan and saute onions and cumin for 4-5 minutes, until softened. Add garlic and cook for a further minute. Add tomatoes and simmer, covered over low heat for 10 minutes. Stir in stock, oregano, pureed corn and remaining corn kernels and bring to the boil. Cover and simmer for 20 minutes or until corn is cooked. 4. Ladle soup into bowls, dollop yogurt on top, sprinkle with bacon, coriander and pepper. Serve with tortilla chips. Tip: If you prefer a slightly thicker soup, simmer for an extra 5 minutes, uncovered, before serving.